The initiative of the Centre for Sustainable Agricultural Mechanization of the United Nations Economic and Social Commission for Asia and the Pacific (CSAM) on “Capacity Building on Sustainable Agricultural Mechanization to Facilitate Poverty Alleviation in Chengbu County” marked an excellent moment with a Machinery Donation Ceremony on 26 October 2018, in Wuhan, China during the China International Agricultural Machinery Exhibition. Facilitation of machinery donation to Chengbu County is one of the activities of this CSAM initiative. Dr. Li Yutong, Head of the Centre for Sustainable Agricultural Mechanization of the United Nations Economic and Social Commission for Asia and the Pacific, and Mr. Fang Kai, Vice-Governor of Chengbu Miao Autonomous County, delivered opening remarks at the donation ceremony. Mr. Ma Shiqing, Vice President of China Agricultural Mechanization Association, moderated the ceremony. 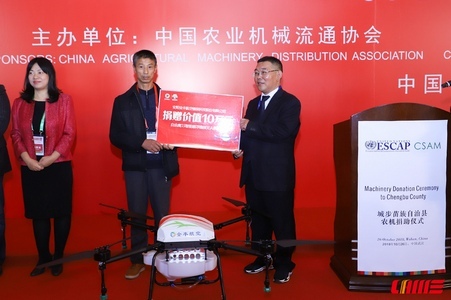 The Anyang Quanfeng Aviation Plant Protection Technology Co. Ltd., Jiangsu World Agriculture Machinery Co. Ltd. and Hebei Shenghe Agricultural Machinery Co. Ltd. donated a drone, a tractor and a cultivator respectively to three cooperatives in Chengbu County. CSAM has joined the UN Country Team’s efforts in supporting poverty alleviation activities in Chengbu County, Hunan Province of China under the framework of the Memorandum of Understanding signed in March 2018 by the Ministry of Commerce of the People’s Republic of China (MOFCOM) and the United Nations in China. The joint efforts of the UN Country Team aim to strengthen collaboration under the United Nations Development Assistance Framework for China (2016-2020) through poverty alleviation and implementation of the 2030 Agenda for Sustainable Development in Chengbu County. Aside from the machinery donation, and in line with the findings of the CSAM visits to Chengbu County and the specific needs of the County, CSAM also organized a Training on Sustainable Agricultural Mechanization in Chengbu on 16 October 2018. The Training on Sustainable Agricultural Mechanization was organized in collaboration with Chengbu Miao Autonomous County Government and Chengbu Miao Autonomous County Agricultural Machinery Bureau, together with the United Nations Industrial Development Organization (UNIDO) China Office. More than 50 farmers and heads of cooperatives and women’s organizations attended the training which covered the whole process mechanization of rice production and maize silage harvesting and baling technologies, particularly for hilly and mountainous regions in China; knowledge sharing for the establishment and operation of agricultural machinery cooperatives; and the role of agricultural mechanization in poverty alleviation. Mr. Ralf Bredel, UNIDO Representative and Head of Regional Office (China, DPR Korea, Mongolia) attended the training and delivered remarks. In addition, on 26-27 October 2018, a study tour to the China International Agricultural Machinery Exhibition (CIAME) 2018 was organized, mainly for the decision makers including officials from Chengbu Miao Autonomous County Government, Chengbu Miao Autonomous County Agricultural Machinery Bureau, Chengbu Miao Autonomous County Agricultural Technology Extension and Service Centre as well as representatives of cooperatives in Wuhan, so as to maximize exposure for the participants to the latest developments in the agricultural machinery sector. Overall, CSAM’S initiative for Chengbu County has succeeded in improving awareness of the significant role of sustainable agricultural mechanization in poverty alleviation; enhancing farmers’ capacity in machinery selection, usage and maintenance, and the capacity of decision makers in leveraging the benefits of sustainable agricultural mechanization in Chengbu County.